*According to Ayurveda, we are all born with a specific constitution, or DOSHA, that shows up in our body, mind and emotions. Phases of life, day to day experiences and the elements of each season influence our natural state of being and create imbalances in our lives. *Ruah Veda Aromathérapie is one of the ways to calm the imbalances that arise. 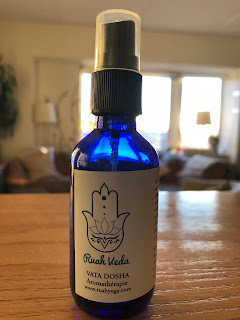 *Depending on the season or what balance you are seeking at the time, each Ruah Veda scent stimulates the olfactory senses helping you to relax and return you to your center. *All scents are based in soothing a blend of sesame oil, sweet almond oil, water, lavender, ylang ylang and jasmine. Ruah Veda Body & Room Spray 2 or 4 oz. How to Use: Mist all over your body and home to soothe your mind, body and emotions throughout the fall and early winter vata season. Spray on your pillow and rub onto your feet at night for peaceful sleep. The dry, crisp air and wind of fall and early winter, Vata, is balanced by warming scents as, frankincense, sweet flag, eucalyptus, cinnamon, cloves, geranium rose and jasmine. The moist, cold weather of winter and early spring, Kapha, is balanced by warming and awakening scents as peppermint, rosemary, basil, eucalyptus, ginger. The warm, steamy weather of late spring and summer, Pitta, is balanced by sweet cooling scents as eucalyptus, pine, sandalwood, peppermint and fennel. *Body: Medium build, muscles come easily. ​*In Balance: Passionate, sharp mind, ​strong willpower, quick on feet. * Out of balance: Impatience, anger, loneliness. *Remedy: Cooling foods and fluids; reduced spice, alcohol and caffeine; nature walks; reduced activity; meditation; slow flow yoga. "It has become part of my evening ritual before I go to sleep. I look forward to it and just love it!" My parents gave me the name Ruah, which is hebrew for breath (of G-d) because it is in both the Torah and the Book of Psalms in The Bible. Veda means wisdom in sanskrit. The name Ruah Veda, for me, felt like the perfect blend of the two things I am so grateful to receive and share on my journey as a woman, mother, wife, daughter and yoga teacher. Also, Ruah Veda sounds similar to Ayurveda, which is what the aromatherapies of Ruah Veda are guided by. After years of blending my own oils based on the ayurvedic seasons to use while offering “svasana massage” and on my kids when I had them do “baby/toddler/big kid yoga.” I eventually switched to blending them into a spray for the room so that when my classes were too big for me to get to each student, everyone could enjoy the benefits of the aromatherapy. Students would always come to me after class and ask, “what is that oil you are using?” I would apologize saying it wasn’t possible to get since I blend it myself. Students would always ask me to start making them to sell, but my busy life of raising two little children, teaching, living the NYC life, I wasn’t about to add one more thing to my life! Honestly, I really wasn’t attached to the outcome of the mantra, but just for fun I wore the mala bracelet every day and tried repeating the mantra for the next few days at the beginning of my daily meditation. Then after a week or so, I let it go and life went on. Then, one day, after a few of my students kept asking me for a few days in a row if I would make the oils for them to have (thank you Danielle, Meredith and Neda! ), I finally made a batch of 12 bottles thinking that at least I could check it off of my list of things to do, my students would have their bottles to take home and I could store the rest for my classes or give them as gifts. Somehow, when I brought them to class that day, all of the bottles were sold and there were requests for more! I was truly in shock and figured it was a one time thing so made another batch and the same thing happened. After the second batch,. three thoughts came to me so strongly, 1) that this felt connected to my intention with the mala beads, 2) that I was excited about the prospect of making this into something special, 3) if this was something where I was going to make money, I wanted to give back in some way. Who knows for sure what the universe will offer in the path ahead, but for now, I am deeply grateful for all that has happened so far. I continue to share Ruah Veda bottles every day and am able to not only use the resources I receive to support my family but also offer a portion of it to charity. I have been donating to organizations that support post hurricane efforts in Puerto Rico, but will be rotating to various NGOs throughout the year. As someone who has a past career in the NGO industry, I remember how every dollar counts in the line item budgets of organizations that serve others. Our world is in such a state of need and could use our help in any way we can offer it - whether it is our dollars to support people helping others, our energy and presence in the lives of those immediately around us or the relaxation that effortlessly comes to us when we spray Ruah Veda aromatherapy.